Last year we got the Curbed Cup. This year L.A. Times called us ‘One of the best neighborhoods left’. Opening up Gallery 38 and creating an artistic renaissance in our West Adams neighborhood with our community work, murals, exhibitions and pop-ups has been quite the journey. 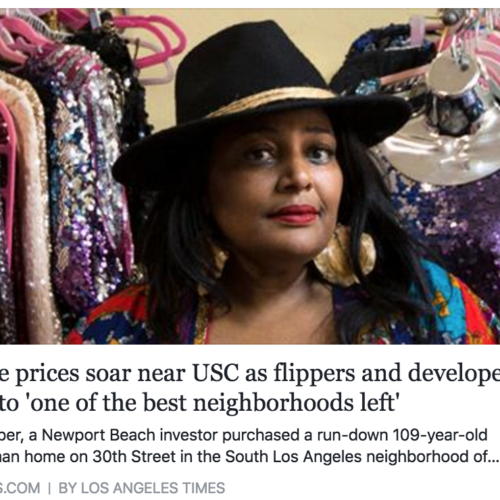 It saddens us though that someone like Zoe Guillory and her vintage boutique are being pushed out because developers are seeing the work we are all doing and raising the rent on us. We will be opening up our space to Zoe with some boutique pop-ups, so that she could still have a presence in the very neighborhood she helped develop. You can check out the full article which ran in the LA Times business section this past weekend, here.